If I had my way, I'd skip from mid-October to March each year. The days are too short, the weather turns cold, the ability to get outside is limited. I feel like a plant that has gone to sleep for the winter. I feel depressed and discouraged, especially once the Christmas lights have all been put away. Compounding this issue is the fact that my oldest son has inherited this tendency as well. So, as Mom, I need to help him get through these days that I'm barely getting through myself. I have the advantage of years of experience and the wisdom of knowing that spring will indeed come. He lives in the teenage moment of now when everything seems overwhelming. We do have some ways of coping . Everyone in the house takes Vitamin D supplements, with my son taking the highest dose. My best friend very thoughtfully got me a Nature Bright Sun Touch Plus Light for Christmas which both my son and I have been faithfully using each morning and which does seem to be helping a bit. We make sure to get regular exercise. And of course, there is chocolate! I recently came across this great infographic from BetterHelp.com which help explains SAD and what to do if you or someone you love is suffering through these dark months. Do You Want to Be Happier This Year? Do you want to be happier? Do you feel that something is missing in your life, but you can’t put your finger on what it might be? Do you know you should focus on what really matters in life but aren’t sure where to begin? In Resisting Happiness, best-selling Catholic writer Matthew Kelly invites us to take a hard look at our lives and our habits so that we can achieve those elusive goals of happiness and a sense of purpose. Given the title of the book, one might think that the primary focus is on happiness, but “resistance” is actually the main topic. Kelly defines resistance as “the desire and tendency to delay something you should be doing right now.” It is something that we all struggle with every day of our lives, often from the time we get up to the time to go to bed. It “stands between you and the person God created you to be. Resistance stands between you and happiness.” The purpose of this book is to help you overcome resistance so that you can be the best version of yourself, Kelly’s term for the universal call to holiness. We are made to be saints, but resistance often keeps us from getting there. Kelly emphasizes that nothing on earth can satisfy your desire for happiness other than God. “Only God can fill that hole that represents our deepest longings.” Yet, most of us spend our time trying to fill that hole with something else, whether it be other people or food or entertainment or any number of things. If we want to keep everything else, even good things (such as other people), in its proper place in our lives, we need to place God at the center. Nothing Kelly states is new. Saints have been pointing the way to holiness since the Church began. Kelly discusses the importance of daily prayer, the value of Mass and Confession, the importance of sacrifice and self-denial, the need to love and serve others, discerning and then doing the will of God. These are the ways that we focus on God and gain true peace and happiness. Never-the-less, the struggle of life is real. Resistance is real. What Kelly excels at is making the path to holiness seem within reach for the average person. He offers concrete simple steps that anyone can take to move closer to God and to being the best version of ourselves. Understandably, Kelly writes from a male perspective. As moms, we have some unique challenges that men don’t necessarily face (and I would imagine, vice versa). This is especially true in the sections on using our talents for God’s kingdom. I know that there have been times in my mothering journey when it seemed that my talents were exactly what God was asking me to sacrifice. While I’ve always tried to contribute to the world using my gifts in some small way, this often has had to take a back seat to the vocational call to motherhood. My family has needed me more. The daily chores have required my attention. Things I wanted to do, or even felt called to do, had to come second, or third, or even last in the list. 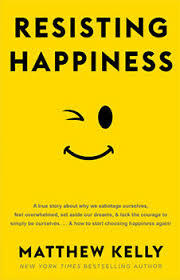 That being said, Resisting Happiness is a valuable book to spend some time with. I plan to have my teenage sons read it as part of their homeschool religion class this year. Even if you know what you should be doing to get closer to God (our ticket to lasting happiness), this book serves as a helpful reminder. You are sure to find one or two spiritual practices you could incorporate into your life. In her debut novel, Frances Maureen Richardson explores the lives of three Catholic siblings over the course of several decades. Not All of Me is Dust is an ambitious, sprawling work exploring what is means to be human, face temptation, and listen for and follow God’s will. Kathleen is the burdened oldest sister, forced to take over a maternal role to her two younger siblings after their mother’s untimely death. Clare is the youngest, broken-hearted as her older siblings leave home. She is desperate to grow up herself and figure out what she should do with her life. The majority of the story focuses on Stephen, idealistic and intellectual, who answers God’s call and becomes a Jesuit priest. Richardson, who has a master’s degree in religious studies, has penned an intelligent, well-written story. The characters are well-developed, multi-faceted and flawed. They are fully human, struggling with life and the consequences of their actions. 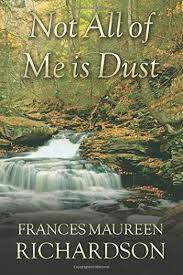 Not All of Me is Dust is an excellent addition to the genre of Catholic fiction.